You’re steering your car around an unfamiliar city, close to lunchtime, and you’re not exactly sure where to eat, let alone where you can park. But your in-car infotainment system springs into action, serving up not only the location of a nearby parking lot but also coupons and offers for restaurants just steps away from where you’ve left your car. It’s called contextual marketing, and to some drivers, it sounds like a dream—tailor-made offers delivered right to you based on your location. To others, it’s more of a nightmare—advertising finding yet another way to intrude on your daily life, and inside the privacy of your own car no less. Whatever you think of the practice, it’s not going to go away any time soon: In-car marketers are looking for new ways to tap into your automotive data to deliver targeted messages and offers. The trick, experts say, will be for these kinds of ads to walk the fine line between being useful or being annoying. “There is an opportunity for in-vehicle marketing to be beneficial to consumers, if done in an unobtrusive way,” Andy Gryc, conference director for the Connected Car Expo told me. As cars continue to have connected capabilities with preferences, social networks, web searches, and calendars, marketing will be precisely geared toward a driver’s likes and needs, Gryc says. 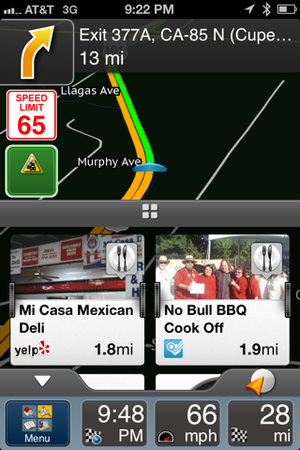 Magellan’s SmartGPS serves up location-based information from the likes of Yelp and Foursquare. It’s already happening on some level. Take Magellan’s SmartGPS, which launched last year. The navigation device features a tiled interface, where the tiles serve up information relevant to your location—including nearby offers through Foursquare. Gryc believes that we’re just in the early stages of car makers and in-car system designers working with app developers to better integrate marketing into the connected car experience. “The car is going to be a part of people’s connected lifestyles like the smartphone is today, a crucial tool for making life easier,” he said. As with any marketing, though, the challenge will be to make it a service and not an imposition on the driver. Kiip offers rewards to users of affiliated apps; it recently signed a deal with Mojio to offer the same kind of rewards to drivers who use the soon-to-released driving data logger. Mojio makes a $149 device that connects to the on-board diagnostic computer in your car and includes a companion smartphone app. Mojio’s device logs real-time data and combines it with other information to help users drive better. Good driving during a rain storm, for example, may trigger a reward for a free installation of windshield wiper blades. “A driver who is stressed, drives around for a long time, finally finds a parking space at 6:00 pm, after he gets out of the car, he is rewarded with $15 towards dinner at a nearby restaurant from OpenTable on his smartphone,” said Wong, offering an example of how the Mojio-Kiip partnership would work. Another possible reward may be a free coffee for leaving for work early. It won’t be long until we see how the reward program works in practice: Mojio is set to arrive later this spring. To marketers, your car may look like a giant browser, providing information about your activity combined with location data, according to Roger C. Lanctot, associate director in the global automotive practice at data analysis firm Strategy Analytics. But Lanctot thinks it’s key that drivers should be able to personalize choices, opting in or out of out of offers. Aha Radio’s location-based ads give users the option to redeem an offer by tapping on a Thumbs Up button on their in-dash infotainment system. Aha Radio does precisely that with its audio location-based offers to in-dash systems. An ad comes on the radio promising a free drink and chips at a nearby Quiznos Subs; all the driver has to do is tap a “thumbs up” button on the in-dash screen to receive the coupon via email. Aha comes pre-loaded in nearly 50 types of cars, including models from Acura, Chrysler, Ford, Honda, Mazda, Porsche, Scion and Subaru; it’s also available in aftermarket head units from Pioneer, Kenwood, and Alpine. Personalization is going to be critical, Lanctot contends, especially when it comes to who’s driving the car. “I don’t want to get offers for nail salons and day spas that are meant for my wife,” he added. Even the availability of connectivity provides opportunities for carmakers to reach out to drivers. A growing number of cars are offering 4G LTE connectivity as a feature—General Motors, for example, is adding 4G to more than 30 of its models during the 2015 model year. Lanctot sees an opportunity for dealers to lure drivers back to the dealership by offering a free month of 4G LTE service; other companies—Lanctot cites McDonald’s, Exxon, and Starbucks—could even offer to pay for your 4G as part of an in-car marketing campaign. This story, "In connected cars, advertising will come along for the ride" was originally published by TechHive.